Sensei, don’t you have the feeling that sometimes, especially during the seminars, you don’t have “control” over the people who you are testing? Often You don’t know persons who are taking the test, they are recommended by their instructor. Well, I have to trust instructors, their recommendations. Unfortunately, sometimes I don’t agree with the recommendations. I know, for example, look at the situation in Germany. After Tamura Sensei passed away people were driving Jochen crazy, asking him about the testing during the seminar in Bernau. Many of those people have never shown up for my classes and never had an interest in my seminar. They are only coming now to take a test. Well, I will refuse them! I have some rules. For example, I have never accepted any French people because of respect for my senpai, Tamura Sensei. So I don’t do tests in countries like France or in Italy, where Tada Sensei was involved. I don’t want to create any conflicts with my fellow teachers. It makes no sense. I have to be very careful with tests and again I have to use my own judgment. Unless there is a recommendation by a teacher I know or by the organization, I won’t accept people for a test. Not everybody can step in to take a test. A seminar is not for giving a test. The main purpose of the seminar is training. I understand that there are some people in unfortunate situations, and they need my help. But they have to show up and attend my seminars two or three times, and then maybe take a test. They can’t just come and ask for a test. There are countries where there are more than one national aikido federation. What is more, sometimes there is competition between those federations. What is your opinion about this situation, Sensei? That is the biggest problem Aikikai is facing because of the regulations it has made. Those regulations were made about forty years ago. Many organizations that got recognition thirty, forty years ago don’t even exist anymore. That is why I keep telling them that Aikido society has changed in the last 40 years, it is much bigger and many more people are involved. It’s a very touchy subject. Most practitioners don’t care about recognition. They are interested in whether they can register their dan with Aikikai. That is all that they want. So the recognition system as it exists causes problems. The system is just one of the problems, but another is people’s aggressive mentality…? Yes, I didn’t want to get into this, but I will. This kind of mentality is characteristic of insecure persons. They use Aikido as a tool to get a better position in society. Unfortunately, most of these people don’t practice hard on the tatami. And unfortunately, because of the nature of Aikido I discussed earlier, they can even teach others. Very unfortunate. As I said before, what is good about aikido is also the problem of aikido. I don’t call aikido ‘Budo’ anymore because what makes Aikido so popular is its flexibility, lack of competition, no physical requirements. Anybody can practice. That is a good part of aikido. I’m always happy to see people who have a physical problem that would prevent them from practicing other martial arts enjoying themselves with Aikido. That is the beauty of Aikido. If Aikido were pure Budo, it wouldn’t be so popular. But unfortunately, some people use Aikido’s popularity in the wrong way, to build their own power. Maybe because these problems exist, we should adopt more principles from budo? This is a dilemma. Do you remember the Combat Games in 2010 in Beijing? Forget about these combat games! We should avoid that because in Aikido philosophy there is no place for competition! Aikido doesn’t create any competitive mind. That is why Aikido became so popular. And because certain people are interested in the competition they agreed to take part in the Combat Games. I’m talking about the IAF – International Aikido Federation. They ignored others’ feelings and attended the Combat Games. But Aikido doesn’t belong to IAF members only, aikido belongs to everybody. It was not fair. It seems that we are facing a lot of problems. What is the Hombu Dojo and Doshu’s point of view on this situation? Are there any plans to change it? Doshu doesn’t want to see any fighting. But every leader has a responsibility, to do something or listen to others’ opinions and advice. Unfortunately, after the passing of Tamura Sensei and Sugano Sensei, there are not too many of us left who have wide international experience and can provide a constructive point of view. Sensei, if you agree, let’s talk about Hombu Dojo. What do you think, what is the Hombu Dojo’s strategy in terms of Aikido development in the world? I don’t think Hombu Dojo has any specific picture. They are happy that the number of members has increased. In my opinion, the time of spreading aikido to the world is finished; now we have to focus on quality. That is another suggestion I gave to Aikikai. Aikido is already very popular. For instance, in New York Aikikai, we don’t have any advertisements. Of course, I understand that each dojo needs to be advertised, but there should be some limits. Don’t focus only on the business part. You have to keep a balance between that and the pureness of Aikido. It is very difficult. What is the Hombu Dojo’s point of view regarding the high ranks? Well, the ranking system in aikido is another headache. I personally disagree with this system. A teaching certificate is okay, a black belt is okay. But after that, no numbers, no shodan, no nidan, etc. People know who is good and who is bad. The dan ranking system creates a competitive mind because people judge others – “oh, he is sixth dan, but he is not good, this guy is much better…” It is very difficult to judge in Aikido. It all depends on how the examiner interprets Aikido. Again the good things about aikido – flexibility and individuality – are also a problem because there is no standard of judging tests. In judo it is very different; if you don’t win, you don’t get a rank. Because judo is a sport. Yes, it is a sport, so they allow competition. But aikido denied that, we don’t have competitions. OK, assume that we keep the ranking system; that is fine. But let me judge! I don’t need to conduct a test to judge my students. I understand that people need that kind of opportunity to show their accomplishment, but it is not necessary for me. I know their quality. I know their daily attitude, commitment, etc. I’m very sorry to say this, but if you are a good dancer, good performer, you still have a chance to pass a dan test. If a person has a good uke, he or she may pass the test. So this system is not fair. Of course with my eyes I can see the inside, not only the surface, but this is difficult unless you are a professional teacher. But even then it is difficult. Let’s say a person I don’t know comes to take a test. He is a good performer, he has a good day, and he passes. And then he goes back to his dojo, to his daily bad attitude on the tatami. So I ask, what happened there? That is why I’m against this testing system. I respect my instructors’ decisions. Your judgment is more important. I don’t have to test your students. Besides, I don’t think that O-Sensei agreed with that ranking system. To him, the number doesn’t matter. Once when I was giving him a massage he said to me “Mr. Yamada, what rank are you?” I answered: “I’m shodan,” and he replied: “So today I’m giving you sandan.” [laughs] Nobody believed that. I knew his personality and I didn’t take it seriously. I just answered, “Thank you very much.” That is what happened. What a story! Was it often the situation in those days? Yes, it is a true story! That was often the situation. There was a teacher and everybody complained that he was promoted to 10th dan. And believe me, I liked him and it was nothing against him but I know technical aspects. He was way below Tohei Sensei or Saito Sensei. But O-Sensei treated him very well and gave him 10th dan. If O-Sensei gave me 10th dan I wouldn’t believe it. I just would say “Thank you” and wouldn’t make it public. O-Sensei didn’t care about ranks. So, what do you think Sensei about the Shihan system? I don’t know how this system started but again because of this system, Aikikai has a lot of troubles. Shihan is not a title. It is a different way of saying “Sensei” in Japanese, but with a little more respect. So you could be a Shihan to your students. If you were a little bit older, and your students respected you a lot, they would call you a Shihan instead of a sensei. That is all! It is not a title. That is why it is the only certificate that Aikikai doesn’t charge for. It is free. [laughs] But again Aikikai has a problem accepting applications. Basically, the regulations are six years after fifth dan you may get a sixth dan, and apply for Shihan. That is a qualification. But even though the rules are clear, there are a lot of contradictions. If I recommend one of my students as a Shihan teacher, they may reject it: “He doesn’t have enough experience…” So I’m asking: How do they know? This is my student. It is not a record in a computer, she or he cannot be judged by a number. It is my recommendation! A Shihan is assessed not only on technical skills but also on their attitude as a human being. You cannot judge a person by numbers, for example, how many years he or she has been practicing. I know the Aikikai needs some regulations, but they should be flexible. That is my opinion. Whoever I recommend, they shouldn’t reject. That insults me. I know my students. They shouldn’t judge by numbers. Let’s say that you need 4 years of practice for another rank. What does it mean? Some people practice every day for 4 years, and some people only once a week for 4 years. Should we treat them the same way? These days everyone wants to get this position that is only a title. Just like the other ranks, because it does not have any standards, people describe themselves differently to get the title. We heard some complaints like; “why this man is Shihan while I am not? I have the same rank with him and practicing for years.” These are stupid discussions that caused from the system. Why do they need this title? It is enough for me to call as sensei, I do not care to call as Shihan. But the Japanese do get the title of Shihan automatically don’t they? This is one thing I do not like. This is actually why I started issuing Shihan titles to foreigners because they wondered why it was reserved for the Japanese. They do a lot of dumb things at the Aikikai, they invent titles regularly. For young people, they made up the title of shidobu Shihan. Tamura Sensei and I had a slightly different title I think (laughs). These things are ridiculous. Last year a group [from France] gave me a list of about 20 people, but the Aikikai selected only three of them. So I said “I cannot go back and explain that only three of them will receive this title. Forget it and give me back the list”. I went back, explained the situation, and told them to negotiate themselves, that I was out of it. 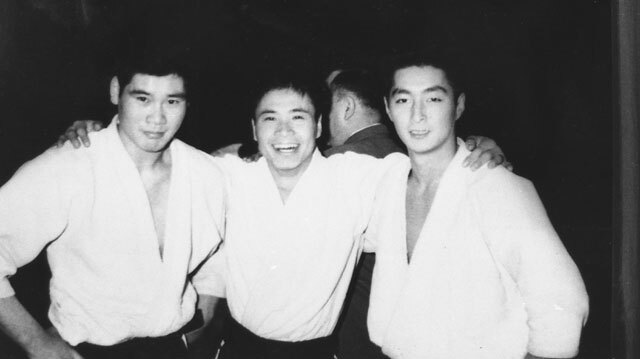 How did the Aikikai choose these three people that they did not know? Based on what criteria? The only one who knew them was their master. Moreover, some of the older practitioners in that group were not included in these twenty names because they had bad relations with their officials. This is not my problem but it was not fair. And when I got the title for one of those elders, the group got angry against me. I said, “But why was his name not on your list? It’s not fair, and as far as I know, it is one of the oldest amongst you”. All this is politics, it is terrible. I said to that elder: “You know that you are not welcome in that federation and you often complain about them. Why do you not leave?” People talk to me about insurance and things like that but these are excuses. I do not want to get mixed up in these stories, but many people leave the federations. I want to help the groups in memory of Tamura and Sugano Sensei but on the other hand, I also have many friends who do not belong to these groups. What should I do? Next week I have to see yet another group that complains because someone has been promoted, but it is not I who promoted him (laughter)! These are internal problems in which I do not want to be involved. It looks like that Tamura Sensei did not want to sort this out before he passed away. Yamada Yoshimitsu: It is complicated. I think he was not interested in that. He was my best friend and the best of my sempai. But everyone is human. He never wanted to get involved as much as I did in my own group. I have often witnessed scenes where he refused to get involved. I asked him why he did not settle the argument, and he said he did not care because whatever he said always ended up in fights so why bother. I loved that, what a great principle (laughter), so clear. What do you think of the Aikikai system and its future? Problems are inevitable when an organization grows but there are still many unresolved issues. The Aikikai is trying to rule everything on the basis of reports, hearsay, which do not always emanate from the right people. For example, my students are happy here and they do not contact the Aikikai to complain or ask for things. People who contact them are usually those who want to get something, or sometimes to express resentment. Decisions based on biased information cannot be good. But how can they know about the problems abroad while they are in Japan? There are so many contradictions, inconsistencies, and injustices. The way grades are awarded, the Shihan system, the Aikikai recognitions, all these things are not right and create a lot of problems. Take for example the recognition system by the Aikikai. In the end, it is often those who have obtained it who create problems because they believe that they alone have the right to practice Aikido. I fight against these things but I am always facing dilemmas due to my position as both the representative of the Aikikai and as the director of the American Federation, but I always try to do things in the interest of practitioners. I am torn in the middle of all that. Sensei, is there anything else you want to say? Well, please stop minding other people’s business! Aikido has many different ideas, different points of view, different translations. And you cannot say who is good and who is bad. Of course, there are unforgivably bad people involved, bad instructors involved. But just ignore them, forget about them. Stay with what you believe, what you are doing. Just don’t fight. I know it is difficult; human beings always seem to be fighting. Just take care of your own students. Your students are your treasure. No Replies to "Interview with Yamada Sensei about Ranks"